It’s time to bundle up in your warmest cold weather gear and head out on the ice for the 2019 Color the Wind Kite Festival in beautiful Clear Lake! This Saturday, February 16th, marks the return of one of North Iowa’s favorite winter traditions! Come to the Downtown Seawall (10 North Lakeview Drive) from 11 am to 4 pm to see the sky filled with incredibly, colorful kites! It is fun for the whole family! 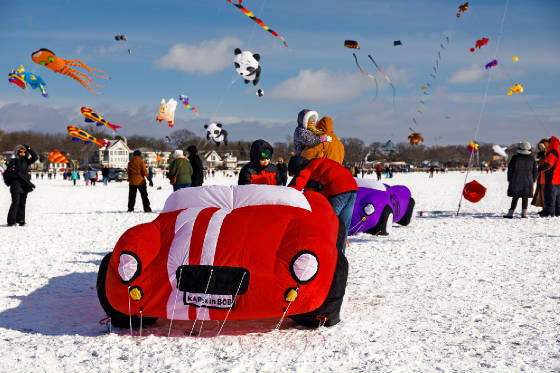 This event is the midwest’s largest winter kite festival! It features giant inflatable kites with participants from all around the country! And, admission is FREE! Pick up your own beautiful kite for sale from Route 66 Kite Shop (located in the Lakeview Room) to join in on the high flying fun! Enjoy delicious hot food from Smokey Heights and delicious sweets from a local Relay of Life team. Check out incredible performances throughout the day by two talented, professional stunt kite teams: Team 180GO and Fire & Ice Alchemy. Take the little ones over to the Clear Lake Arts Center (17 South 4th Street) that morning to make their very own kite. This free Kids’ Kitemaking Workshop will begin at 10 am and continue until the kite kits are gone. Please note there will be limited parking close to the flying field. Luckily for all of us, the Clear Lake Chamber of Commerce is offering a free trolley service from 10 am until 4:30 pm. The trolley will pick up from Clear Lake High School (125 North 20th Street), where parking will be available, and will drop riders off in the vicinity of the festival. Check out our Website and follow us on Facebook for information on more great North Iowa events throughout the year! Jane Fischer & Associates wishes everyone a warm and fun time at Color the Wind 2019!